I saw this recipe in Bon Appetit several years ago. It’s morphed a bit, as I’ve made it and refined it to our tastes. But the basics never change. It really is that simple. Sometimes Stud Muffin wants it made with olive oil or adds garlic. It doesn’t really matter. It’s all good. The meatball recipe is very good, too, but I don’t really follow recipes for meatballs. I like a mixture of ground beef and ground pork. I add an egg, some breadcrumbs, some parmesan, and some seasonings (salt, pepper, oregano, basil). Sometimes I cook the meatballs in the sauce. Sometimes we want a meatball with a bit more texture so we’ll roast the balls in the oven for fifteen or twenty minutes. When they have a nice color on the outside, then we pop them into the sauce. We often make lots of meatballs and freeze some to use later. This is about the most delicious and simple recipe ever. 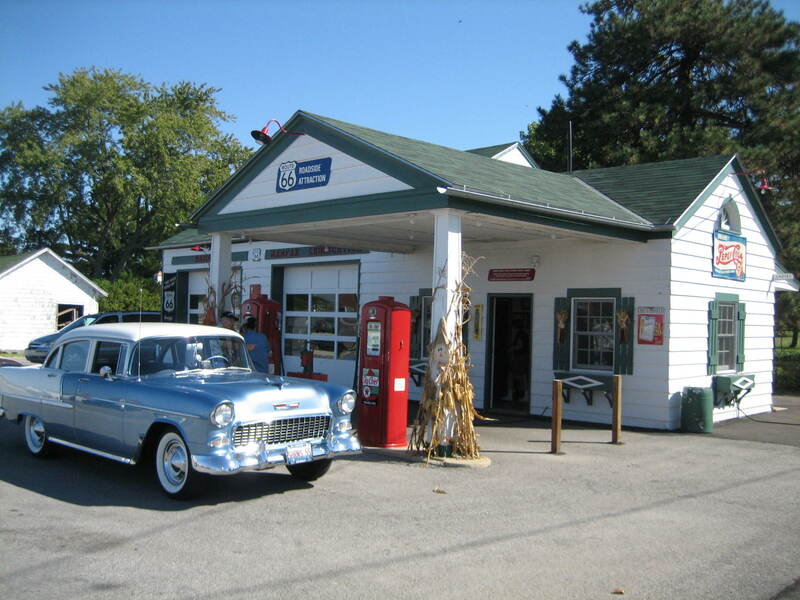 The gas station we drive by on our way to town had gas this morning for $3.19. Someone at church mentioned this morning that Costco was down to $2.99. My first thought (unspoken) was: How long will that last after the election in a week? I didn’t have to say it though, because someone else did. We laughed, and the conversation moved on. But it made me a bit sad that our government has become so untrustworthy that anything good is suspect. I still wonder: are gas prices being artificially lowered to lull voters into thinking things are good the way they are now, why vote for anything to change? I’m interested in what others think about this. What say you? I was supposed to do this last week, but I totally missed the boat. I was nominated by my friend, Brenda Hendricks. Check out her blog for her responses! 1) What is the name of your character? Is he/she fictional or historic? Definitely fictional. Ginger Sanders is a successful radio psychologist in San Francisco. She’s finally achieved her dream: a syndicated show. But before she can savor her success, she accidentally tells a caller that her husband needs to beat a little sense into her. Quicker than you can say “Oops,” Ginger is fired. At home, she discovers that her husband left her. A week ago. And she was too busy to notice. All of a sudden, the woman with all the answers has none. 2) When and where is the story set? The story begins in San Francisco, California. When Ginger’s life falls apart, she heads to her hometown of Hart’s Leap, in the Sierra Nevada mountains, just south of Yosemite. Her mom is having surgery so she goes home to take care of Mom and figure out how her life went so wrong. 3) What should we know about him/her? Ginger has always had an opinion and an answer for anything. When her life falls apart, she’s forced to accept that she’s not quite as together as she thought. 4) What is the main conflict? What messes up his/her life? Ginger herself messes up her life. She thinks she’s doing the right thing, but she’s waaaay off course. When Ginger discovers that her mother has become a hoarder, she orders the house cleaned out. This is not a good idea. 5) What is the personal goal of the character? Ginger wants her marriage and her family back. 6) Is there a working title for this novel, and can we read more about it? GINGER SNAPS BACK is my working title. 7) When can we expect the book to be published? Hopefully in 2015 or early 2016. God willing. And now, to continue the blog hop, I nominate : Cora Ramos and Beth Shriver. Thanks! This is possibly the funniest show on television right now. I love it. I tend to not watch shows until they’re at least a few months old, or even one to two years. I’ve been burned too many times by networks canceling something I loved too soon. So I want to be sure it’s going to be around for a while before I invest much time. 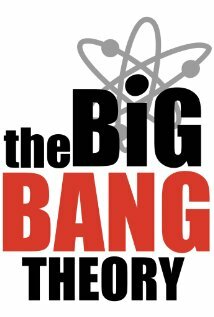 So I didn’t start watching Big Bang until the second season. I was immediately hooked. The setup: Two Cal Tech geek/geniuses live across the hall from a beautiful but not especially brainy young woman. They forge friendships and even romantic entanglements. 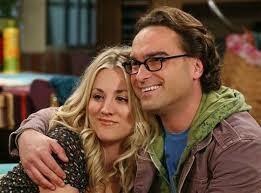 The story follows Leonard and Sheldon (the roomies), their friends Howard and Raj and the women they love. I recently watched the first few episodes and enjoyed the look back. Sheldon wasn’t quite as socially inept as he became over the next seasons. The current season though, I have to say, has been a disappointment. It appears the writers have run out of material. The setups are lame and the jokes are predictable. think this will open more possibilities. All the usual newlywed adjustments could have some possibilities, not to mention Sheldon’s adjustments to losing Leonard and having to either live on his own or train a new roommate. I still love the series. I’m still taping the series. But I don’t watch it as soon as it airs anymore. I get to it. In the next week or so. I have hopes it will find its way again. What shows do you feel have “jumped the shark”? It’s been one of those weeks. But I’m getting in at least one post this week! Good thing Best Food Writing 2014 lives up to its name. A well curated collection of essays, profiles, and articles, each selection deserves its place in this annual compendium. The articles range from serious examinations of current events (feeding families on food stamps and food bank handouts) to humorous (choosing homemade ketchup over a longtime friend). There are memories (tomato pie in Rhode Island) and commentaries (beyond the locavore to invasivore and free range gatherers). I was surprised (although I shouldn’t have been) when what I was reading intersected my real life. I witnessed the lines at Hapa Ramen in San Francisco, shopped the farmers market there. After reading about $4 toast, I began seeing it. For anyone who appreciates good food, whether it be as a home cook or diner at a fine restaurant, Best Food Writing 2014 has something for you to appreciate. I received a free advanced e-copy of this book in return for a fair review. I ate it up and am grateful. We’re home from our San Francisco trip and had just as good a time as we expected. Even better, maybe, and we had pretty high expectations to begin with. We did visit Mama’s and loved it. The wait was under an hour and the food was well worth it. I had the Bayshore Shrimp omelet while Stud Muffin had the French toast sampler with orange-cranberry bread french toast and banana nut bread french toast. The service was excellent. Even though the line still stretched around the corner, we never felt rushed or like we couldn’t stay and enjoy a second cup of coffee as long as we wanted. 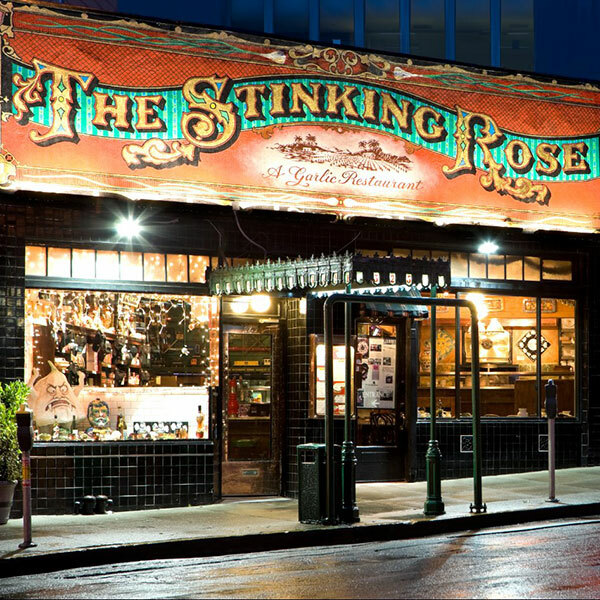 The other city “main stay” we visited was The Stinking Rose. It bills itself as “A Garlic Restaurant” and it lives up to that. There’s a far of something that looks like pesto on the table, but it seemed to be more garlic and parsley than basil. Garlic-olive oil is on the table also. I had the Neon Ravioli which were filled with potato and cheese and served in an alfredo sauce. Dave had the fettucine in a garlic, butter, and lemon sauce. Both dishes were tasty. Because we all had plenty of garlic that night, I can’t say how long the aromas lingered the next day but I do know we’re all safe from vampires for quite a while. Each day we splurged on breakfast, skipped lunch and for dinner either had snacks or went out. Drinks at the View Lounge at the Marriott. Dinner at New Sun Hong Kong (very good, a recommendation from a waiter at the View Lounge when Stud Muffin asked where to get good noodles). Breakfast at Sears, a local favorite. I had Eggs Benedict, which is always dicey because I don’t love poached eggs, but these were excellent. Whew! Stud Muffin had the Veggie Omelet. Watching the Giants game at Bartlett Hall. The fries were A. May. Zing. We shared fries and had drinks while watching the game. 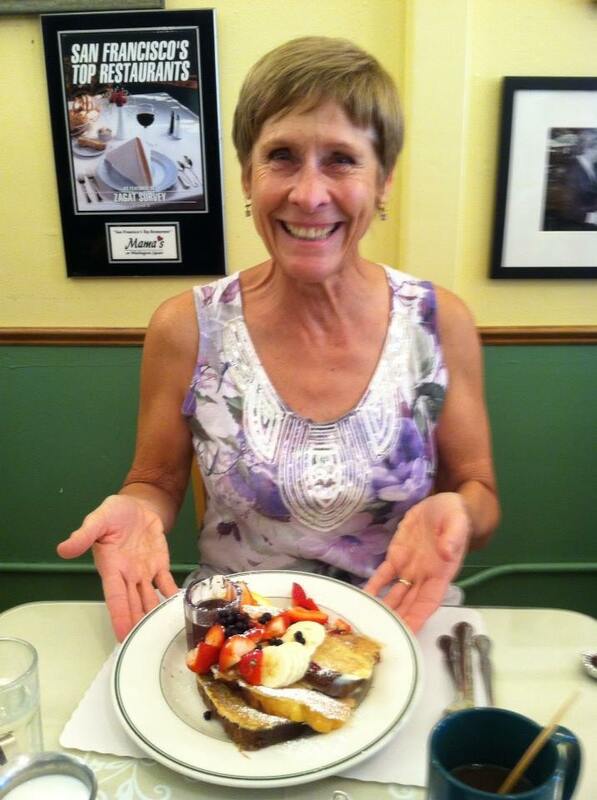 Breakfast at Dottie’s True Blue Cafe. We needed another breakfast place so I searched for some Diners, Drive-Ins & Dives recommendations in the area and found Dottie’s. So good. Another wait in line, just like at Mama’s but also like at Mama’s, well worth the wait. I had the Fried Egg Sandwich special and it came with fruit! The first fruit I’d seen in San Francisco. Delicious! The egg was just like how Stud Muffin occasionally fixes his fried egg sandwiches: scrambled in a bowl, then poured into a hot skillet and cooked without further stirring, almost like an omelet but without any filling or turning. When the egg is done, he lays it on a cutting board and either cuts out a circle or a long strip that is folded and placed in the sandwich. Dottie’s egg was folded and topped with cheese and avocado, served on a small english muffin. I couldn’t finish it and I mourned leaving some of it on the plate. Dessert at Ghiradelli’s. I had a scoop of chocolate with some peanut butter topping. Stud Muffin can’t have peanut butter, chocolate, or really anything very late in the evening, so he shared a couple bites of mine but didn’t have a dessert of his own. My companions had hot fudge confections and malts and all kinds of yumminess. We also picked up a flyer for an eating tour of San Francisco. You can tour North Beach/Little Italy, Chinatown, or all off the above. We may have to check that out on our next trip. So much good food, so little time. It’s finally here! 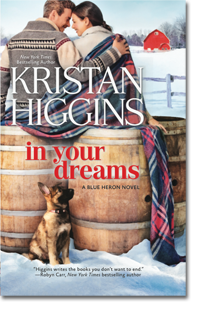 The next installment of Kristan Higgins’s Blue Heron series. In Your Dreams arrived in my mailbox Friday and I took it on vacation with me. We were so busy, I didn’t do much reading until we were headed home and then I devoured this one in a day and a half. This is Jack Holland’s and Emmeline Neal’s story. We’ve met Jack before in previous Blue Heron books. His sister Faith was the star of The Best Man and Holland was the heroine of The Perfect Match. We probably met Emmeline in a prior book too, but truly, I don’t remember her at all. I expected either Jessica or Connor to be the focus of this one. Emmeline is one of the three-person police department of Manningsport, New York. Jack Holland is the scion of the Holland family and the winemaker at their family vineyard. Her ex-fiance is getting married in California and she needs a date for the wedding. As horrible as attending the wedding will be, not attending will be worse. Jack is struggling with issues of his own after saving some teenagers from drowning after the car they were in crashed in front of him. Plus his own ex is in town and a weekend in the sun sounds like a good deal. What neither Jack nor Emmeline expects (though of course, all romance readers know it’s coming) is the feelings that develop between them. This is Higgins’s longest book yet and I was skeptical that she could hold my attention the whole way, but I loved it. There’s more backstory inserted into this one, but it didn’t slow the present story down at all, and it answered the questions Higgins so skillfully raised. I’m a huge Kristan Higgins fan and I’m only sorry that I still have to wait for Jessica and/or Connor’s stories. This one is great and well deserves all the raves and accolades it is sure to receive.